Car For Sale - Misc. 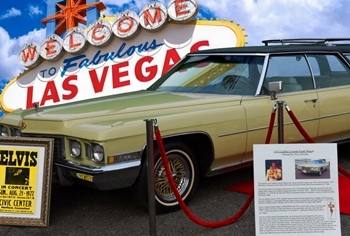 Want to own a piece of Elvis history, well his 1972 Cadillac De Ville Station Wagon is on Ebay for a mere $1.5 Million! The publicity notes.. By the summer of 1977, a 42-year-old Elvis Presley had purchased hundreds of Cadillac’s dubbing the King of Rock as also the King of Cadillacs. He considered them to be the ultimate symbol of American style and luxury. And despite owning a fleet of fancy and expensive vehicles, in the last years of Elvis’ life, his go-to automobile was a 1972 Custom Cadillac Sedan DeVille Station Wagon. That's right! Cadillac custom made only two of these station wagons, the other which they gave to Dean Martin which has since disappeared. This station wagon is one of the rarest cars on earth. It has 24kt gold spokes, 24kt gold Cadillac badge, and more importantly it had a lot of room for Elvis’ friends and luggage to fit comfortably. The 37-year-old Elvis originally purchased this Station Wagon as a gift for his manager Colonel Parker, but drove it himself so frequently from his home in Beverly Hills to his sold out shows in Vegas that Parker surrendered it back to Elvis who gladly took it back. After wrapping up his show in Vegas, Elvis packed up his home in California and drove cross-country to his mansion in Graceland in this station wagon – this would be his last road trip – a pastime which was known to be his favorite. Elvis drove this car until he died only 4 months later at 42. Since then, Elvis’ Cadillac station wagon could be viewed in the Elvis Presley Museum (the car is still titled to the Elvis Presley Museum) until now as it has been moved back to its original home – sunny Southern California. This car is truly one of a kind. I am a bit stale still only remember Elvis "On the Buses" . Rare indeed , station wagon Caddy , still proves again the might of Elvis and what people did for him that they would not do for others , POWER . Long Live the King .